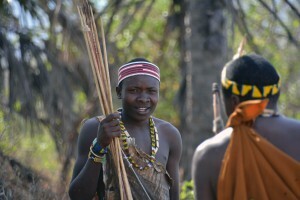 In choosing African Environments for your expedition or safari you have made ethical and responsible choice. Our programs and partnerships support hundreds of families and we endeavour to continue our mission of improving more through fair wages, training and opportunities. If you would like to further donate money or time while visiting Tanzania, here are some suggestions. In the Ngorongoro Highlands, home to some of Tanzania’s most traditional Maasai communities, African Environments has a long-standing relationship with Mysigio Primary School. The School is near to our semi-permanent luxury tented camp, Mysigio, and close to the heart of our old friend, local leader Chief Ole Dorop. Tanzanian primary education is free, though generally lacking is the resources for both teachers and students to best teach and learn. Over the years, with the support of some of our generous clients, African Environments has built and repaired classrooms, supplied desks and blackboards, set up basketball hoops, painted murals, installed windows, and donated text books. Many touring families or groups decide to add a day or two to their Tanzanian safari itinerary work in the community, and donate funds to help complete projects at the school. It is a great way to give back to the community, and see with your own eyes the benefit your time and money make to the students, teachers, and local community. On the outskirts of Arusha, 10kms from the African Environments office is Mateves Secondary School, a school servicing a large disadvantaged region of the city. The school has over 1,000 students and only 10 functioning classrooms, meaning 100 students for each classroom. The majority of the students at the school are Maasai and have come from far villages with non-English and in some cases even non-Swahili speaking households. For these students, passing the National Exam to get a place into Secondary School is quite a feat, and they deserve all the support we give. In the past with help from clients and our own fundraising efforts African Environments has erected classrooms, built desks and chairs, added to outside yard facilities. 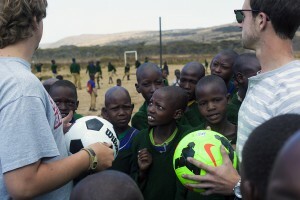 The Kilimanjaro Porters Association Project is a not-for-profit organization working with tour operators in East Africa. It helps monitor the conditions and wages of the thousands of men and women who work as casually employed porters on the mountain. The organization receives monetary donations as well as gifts of gear and equipment which are passed on to porters without sufficient clothing to take part in expeditions. All porters working with African Environments have their clothes, boots and sunglasses checked at the beginning of each climb. 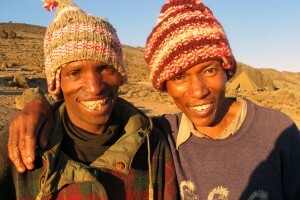 Any donations of mountain gear are given to our hard-working porters. African Environments is proudly working together with the Hadzabe Community in Eyasi. We provide support in their struggle with land rights, earning a sustainable living, and all the while holding on to their culture. We feel that education is the best way to assist the Hadzabe, and would be happy to suggest projects if you are interested in donating funds.